You implemented a new CRM system. Great! But why is no one using it? You implemented a new CRM system. Great! The hardest part is done now, right? Well . . . not exactly. Getting your employees to actually use your new system can often be a major hurdle. User adoption is not simply the use of a CRM system. 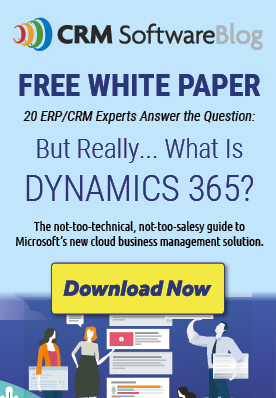 True user adoption occurs only when users want to use the CRM system. Users must be motivated and have a genuine desire to achieve key benefits that the system can bring. You can’t just force a new technology system on your staff. That strategy will never last long term and trying to push it through will be very painful for you and your entire staff. Getting buy-in from the executive level can make a world of difference. Leaders can articulate the strategy, goals and importance of the CRM system, making it easier for employees to understand their role in rolling out the project. As you are preparing the roll out your new CRM platform, it is the perfect time to review your business processes. A system like Microsoft Dynamics CRM is highly configurable and has the flexibility to adapt to whatever business processes you identify. This also allows the CRM to grow with your organization, as your CRM partner can help you reconfigure the system as needed if your business processes change over time. This seems like an obvious one but it can’t be overlooked. We encourage our clients to develop a communications plan to keep the executive team updated on the status of the CRM project, including “wins” along the way. Communication to the end users is also important so your staff is not left guessing as to what is happening and when. We recommend developing a training plan for your team to get the most out of the time spent training them. The plan should include information on role-based training and what training will be available on an ongoing basis. Whenever possible, you should train with real data as it is proven to increase retention among users. Data quality is one the biggest challenges in maintaining your database. As you implement a new CRM system, it is the perfect opportunity to do a thorough cleanse of your data. Pulling bad data from the old system to the new system will only frustrate users. Utilize duplicate detection to merge multiple records into one. We also recommend using a data verification tool during this process to ensure the data is as accurate as possible as it get moved into the new CRM. As we have covered, user adoption is one of the biggest hurdles a company must clear as they implement a new CRM system. But with a good plan and an experienced partner, you can set yourself up for success. For nearly two decades, our CRM implementation experts have implemented and optimized hundreds of CRM systems. Contact BroadPoint today for more information on CRM systems or to schedule a complimentary CRM requirements analysis. By BroadPoint, an award-winning Microsoft Gold Certified partner. Learn more at www.broadpoint.net. Thank you very much for sharing your knowledge of the post, it was amazing and worth reading, it was simple and clear to understand our techniques to improve our business with CRM software, I had many things Before that which has never crossed my mind before. Detailed explained .. Thank you for sharing this wonderful information. A superb blog really loved it…! I think my workplace is going to be moving over to Microsoft Dynamics 365 I’m a little worried about the transition. Training, as you said, is important when getting a new system, and I’m not sure if my workplace has a way for us to study up while on the clock the way new-hires can during their training week period. Role-based training sounds like a great way to save time, and I’ll be sure to bring it up with my boss when I go and suggest getting a CRM consultant to him. Hi Rhianna, We’re glad you found this article helpful. My company, BroadPoint, is a gold-certified Microsoft CRM partner with nearly two decades of experience implementing and optimizing CRM solutions. Would you like me to connect you with one of our CRM experts to discuss your upcoming project? Reply here or contact us at [email protected] or 888.920.2784. Feel free to explore our services at http://www.broadpoint.net. Arguably what you do before implementation of any software is at least as important as what you do after. Your article is spot-on about getting procedures tidied up during a rollout – but it’s critical to get buy-in and input from ‘rank and file’ early in the process. If they’re in the trenches, they’re the ones who know where the sweat flies most. Not that you want them to run the project, but they can definitely provide effective tips to help your plan. It also helps to make sure you don’t leave something critical out of your implementation. As far as I can tell, an excessive number of administrators see the indications of moderate reception, however gullibly trust that the clients will at last come around. Actually, the inverse is more probable. The more it takes to accomplish acknowledgment, the more plausible the CRM programming will neglect to wind up practical. The issue is that putting resources into a CRM application won’t benefit your organization in any way on the off chance that you have low CRM adoption. Most deals reps want to record their information in the way is least demanding for them, for example, spreadsheets or even a note pad. This is on the grounds that business reps don’t see an advantage to entering their information into a CRM framework. Keeping in mind the end goal to get the most out of your CRM speculation, you have to ensure you have a high user adoption rate.